Jakub Sirota ties it for the Black Bears with 1:26 remaining in regulation. ORONO — Jakub Sirota of Maine scored with 1:28 left in regulation Monday and the Black Bears went on to a 4-4 tie with New Hampshire in a Hockey East game at Alfond Arena. Sirota handled a pass from Chase Pearson in the corner before firing a hard high shot through traffic for Maine (8-11-3, 4-5-3). The Wildcats (8-8-7, 4-5-4) had taken their first lead of the game on Angus Crookshank’s goal 1:18 earlier. Brendan Foster led the Black Bears with two goals. Pearson also scored. Jackson Pierson, Chris Miller and Liam Blackburn answered for New Hampshire. WESTERN CONNECTICUT STATE 68, SOUTHERN MAINE 60: Aaron Samuel had 23 points and 12 rebounds to lead the Colonials (12-6, 6-3 Little East) over the Huskies (4-12, 2-7) at Gorham. Trailing by 14 points with just under eight minutes remaining, USM cut the lead to three points with two minutes remaining. Western Connecticut responded with a 7-2 run to close it out. Christian McCue led USM with 19 points. Derek Haney added 15. 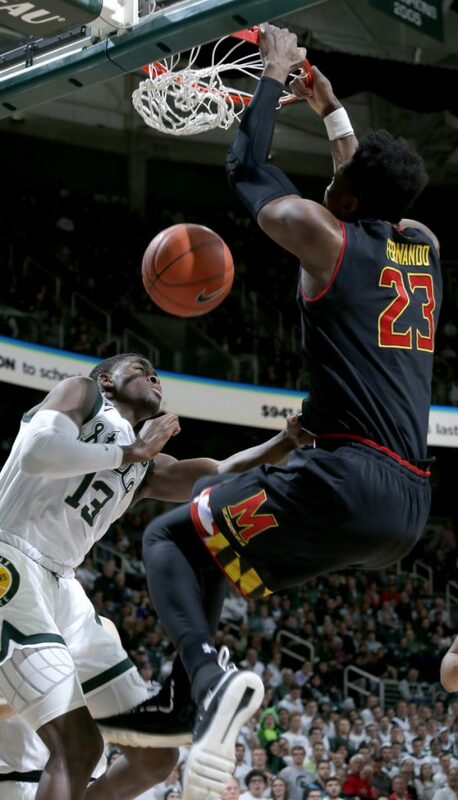 (6) MICHIGAN STATE 69, (13) MARYLAND 55: Cassius Winston and Kenny Goins scored 14 points each to help Michigan State (17-2, 8-0 Big Ten) beat Maryland (16-4, 6-2) at East Lansing, Michigan, with balanced offense and stifling defense. The Spartans have won 12 straight this season to take sole possession of first in the conference. They have won 20 consecutive Big Ten regular-season games dating to last year. The Terrapins had a shot to move into first place in the conference but couldn’t extend their seven-game winning streak. (11) NORTH CAROLINA 103, (10) VIRGINIA TECH 82: Freshman Coby White scored 27 points and North Carolina (15-4, 4-1 Atlantic Coast) knocked down a season-high 16 3-pointers to beat Virginia Tech (15-3, 4-2) at Chapel Hill, North Carolina. POLL: Tennessee is the new No. 1 in The Associated Press poll, climbing three spots to earn their first top ranking since the 2007-08 season. SOUTHERN MAINE 80, WESTERN CONNECTICUT STATE 68: Kristen Curley had 17 points, 10 rebounds and three blocked shots to lead the Huskies (11-5, 7-2 Little East) over Western Connecticut State (7-10, 2-7) at Gorham. Curley was one of the five Huskies in double figures in their best offensive output of the season. Alexa Srolovitz and Jackie Luckhardt each scored 15, Victoria Harris added 11 and Chantel Eells 10. Asiah Knight and Hanna Maghini led the Colonials with 12 points each; Genesis Torres and Gabrielle Hurlbert each had 10. BATES 66, COLBY-SAWYER 50: Meghan Graff scored eight points and Julia Middlebrook added seven as the Bobcats (8-8) opened with a 23-9 run against Colby-Sawyer (11-7) at Lewiston. Graff finished with 19 and Middlebrook 10. Taylor McVeigh recorded 13 rebounds for Bates. (19) SOUTH CAROLINA 79, (25) MISSOURI 65: Tyasha Harris and Mikiah Herbert Harrigan scored 16 points apiece and South Carolina (13-5, 5-1 Southeastern) defeated Missouri (15-5, 4-2) at Columbia, South Carolina. POLL: Utah earned its first appearance in The Associated Press poll in a decade entering at No. 21. The top eight teams stayed virtually the same with Notre Dame leading the way.